Finnish sentiment "Perfect woman in perfect age" got combined with a digital stamp from our sponsor The East Wind. Image is called Diva Lisa 'She' and I colored the lady with my ProMarker pens. I printed out several black and white designer papers and ended up using a stripey one from Cinnamon Scraps and the darker paper is from Scraps N Pieces. 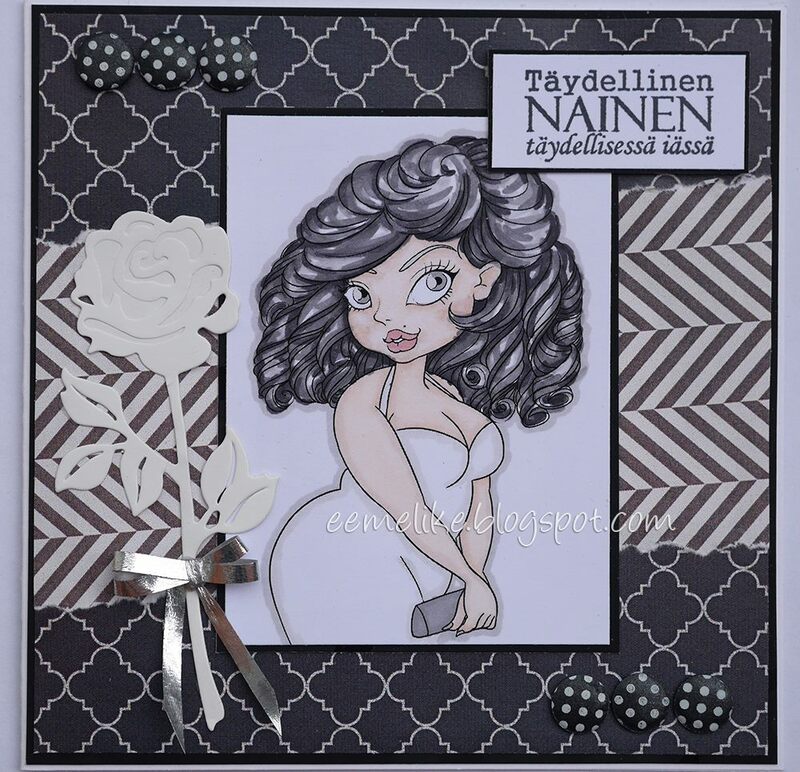 Flower is cut with a Creative Expressions die (new purchase) and the metallic silver ribbon is recycled from a real flower bouquet. Polka dot card candies for the final touch. Leimattu Paperinauhan teksti sai kaverikseen sponsorimme The East Wind 'n digileimakuvan nimeltään Diva Lisa 'She', jonka väritin promarkereilla. Tulostin muutamia mustavalkoisia digikuviopapeita, joista korttiin päätyi raidallinen Cinnamon Scraps 'n ja tummempi Scraps N Pieces 'n yksilö. Kukan leikkasin Creative Expressions 'n stanssilla (uusi ostos) ja kiiltävä hopeanauha on kierrätetty ja peräisin oikeasta kukkakimpusta. Pilkulliset card candyt viimeistelevät tuotoksen. Very cute image and I like how you colored her. Love the papers too! Thank you for joining us at Tuesday Morning Sketches. LOVE this! What a great image, super monochrome and the rose is a lovely touch Eemeli! Wonderful card!! I love your papers and those dotted brads!